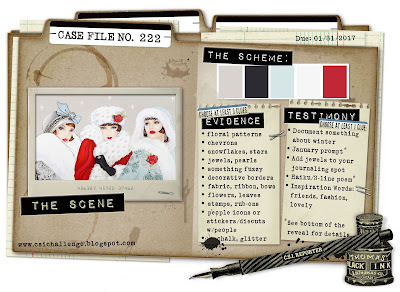 ArtyFartyAnnie: CSI Case File 222 - #Fabulous!! CSI: Color, Stories, Inspiration is celebrating its 5th birthday this month, so the lovely Debbi Tehrani has asked retired CSI Detectives to come back and have a go at cracking a couple of cases and I'm very glad she did too, as it's woken up my scrappy mojo!! The Scheme: yep, used all five colours plus some neutral wood. The Evidence: floral pattern; snowflakes, stars; jewels,pearls; ribbon; flowers; stamping; glitter. The Testimony: I added jewls to my stamped journaling spot and was inspired by the IW "friends, fashion, lovely" to use these brilliant photo booth pics. I have enjoyed being back at CSI again - if you've never been there you should definitely check it out and have a go at cracking one of the Case Files, they really are so inspiring. Show us how you solved the case by linking up on the blog, or there is a CSI Face Book page. I love how you are used so many photos on your page. Gorgeous!!! Thansk your playing with CSI! OMGosh, how fun are those photos! Love all your layering! This is #fabulous!